But, one thing came that nobody could have expected! After countless zombies have munched on miners and snuck their way into houses that forgot to complete all of their walls, the zombies have started to create something more than just spooky intimidation. We found out that they, too, want to build stuff! Who knew that the zombies stuck around after death just because they hadn't finished making up their epic dungeon hideaway? Let your little monster enjoy creating well beyond their dying day with this officially licensed Zombie Costume from Minecraft. 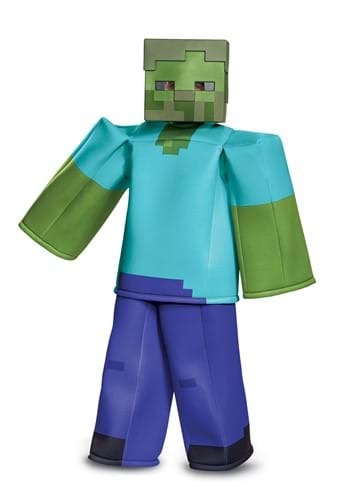 This tunic has the blue, green, and purple colorization that your kiddo has come to expect from the zombies, all made into a blocky form thanks to the foam construction. The mask features mesh holes for the eyes and the pixilated appearance of the formerly monstrous antagonists. Pick up a Diamond Pick to go with the look and watch your little zombie show the Minecraft world that anyone can create!